We instill our faith in the phrase - Vasudhaiva Kutumbakam, which means, the world is one big family. And hence, at Sharda Hospital, we treat our international patients as our revered guests who deserve utmost comfort, care and regard. Our happy patients flying back with memorable stories keep us propelled for sustained hard work and improved hospitality. Your cordial relationship with Sharda will be everlasting. That means, even after you leave the campus, we ensure that your quick recovery happens as scheduled. Enjoy the benefits of Sharda’s best in class post treatment services provided by our valuable staff. Sharda Hospital has a Telemedicine solution, a synergistic convergence of Information Technology with medical science. Sharda Hospital's telemedicine centre uses live video conferencing and real time medical record sharing/communication portal. Sharda Hospital's telemedicine centre uses live video conferencing and real time medical record sharing/communication portal. 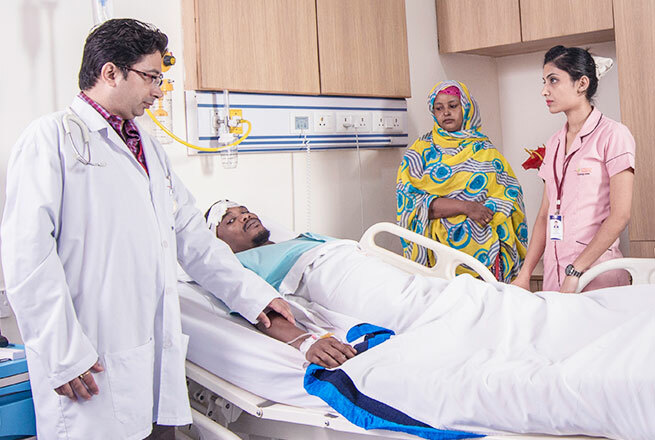 The combination of telemedicine technology paired with specialty medical devices enables Sharda doctors to the patient as if they were actually in the examination room with the patient. The specialist can provide assessment, diagnosis and treatment, request referral, send laboratory test request and provide prescription to the patient. The advent of new technologies has given rise to virtual medical advice from anywhere in the world. With Telemedicine, patients can consult Sharda doctors from wherever they are, using their smartphones or PC. The combination of telemedicine technology paired with specialty medical devices enables our doctors to see the patient as if they were actually in the examination room with the patient. The specialist can examine the patient, review vital signs and patient history, provide assessment, diagnosis and treatment (which can usually be delivered locally), request referral, send laboratory test request and provide prescription to the patient. Telemedicine minimizes the need for travel for both the patient as well as the specialist. To provide patients with an in-person comparable experience, the patient end point is supported by interoperable third party Telemetry enabled medical devices. The devices that the platform is currently integrated with are FDA compliant, HL7 compliant and work as plug-andplay. Currently the platform support a range of 8 telemetry devices. 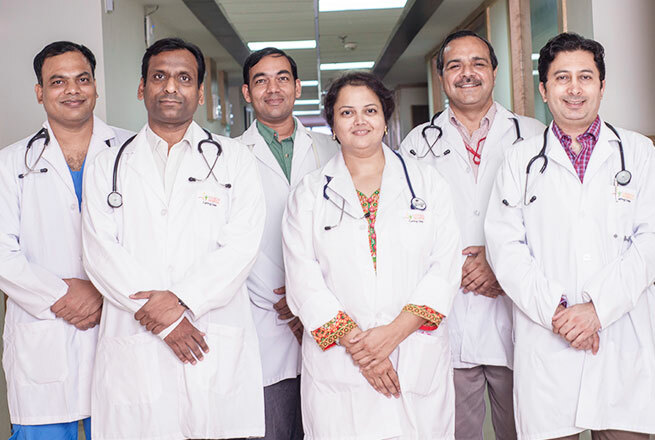 Sharda Hospital aims at connecting our team of 300+ doctors to the patient at any remote location of the world. Sharda Hospital extensively uses Teleradiology for transmission of radiological patient images, such as MRI’s, CT Scans & X-rays from one location to another for the purposes of sharing studies with other radiologists and doctors. This technology intervention helps patients and diagnostic centres in remote locations to connect with Sharda's radiologists with their radiology images for expert opinion and get appropriate treatment recommendations. This service will play a very vital role in reducing patient waiting time for diagnosis, treatment commencement and cost. Tele-Pathology helps to exchange specimen slides with scanned and high-resolution digital images via microscopic digital cameras. TelePathology makes it faster and easier to share medical images. Biopsies can be cut, stained, scanned, magni?ed and sent digitally during an operation. A pathologist can read the slides remotely in real-time and provide the surgeon with an immediate diagnosis. Tele-ICU is a new addition in the ?eld of healthcare to take Sharda's Hospital's critical care unit to a higher level and standard. It is a type of virtual ICU (intensive care unit) that remotely observes a patient’s status via state-of-the-art audio-visual communication and computer systems with the help of a reliable networking with a bedside ICU team. 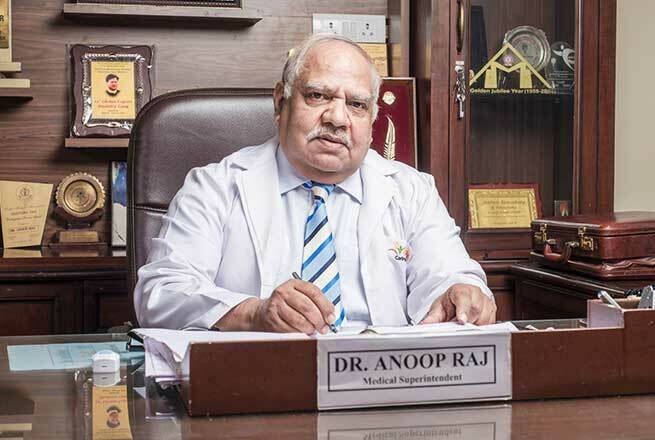 Doctors give expert advice for management of critically ill patients including initiation of mechanical ventilation or noninvasive ventilation, hemodynamic monitoring support, management of di?cult to ventilate patients like ARDS and obstructive lung disease. Get your medical history reviewed - In case you’re suffering from a concurrent anomaly, we advise you to mail us your medical history at * or give a call at *. We shall connect you to the appropriate professional. Your Companion at Sharda - Every member of the hospital will be your companion during the stay here. Apart from that, we have our friendly team of Hospital Companions to walk you through all the processes. Your Companion will guide you from admission to discharge. Don’t forget to click loads of pictures with them after you check out. Your Documents are Safe With Us - Documenting all your medical records, prescriptions, and doctor recommendations is an onus we shall take. Also, we take care of your Visa documents, flight arrangements, and hotel booking papers. Fly Back Safe and Share Your Story - Our happy patients are our strength. You can easily reach your doctor, even after you are discharged. Our tech-savvy doctors would love to see you in the cosy ambience of your home. "The doctors in the hospital were friendly and clarified all my doubts even though I asked too many questions. The team is supportive and patient. The services were of international stature with good cleanliness and hygiene." 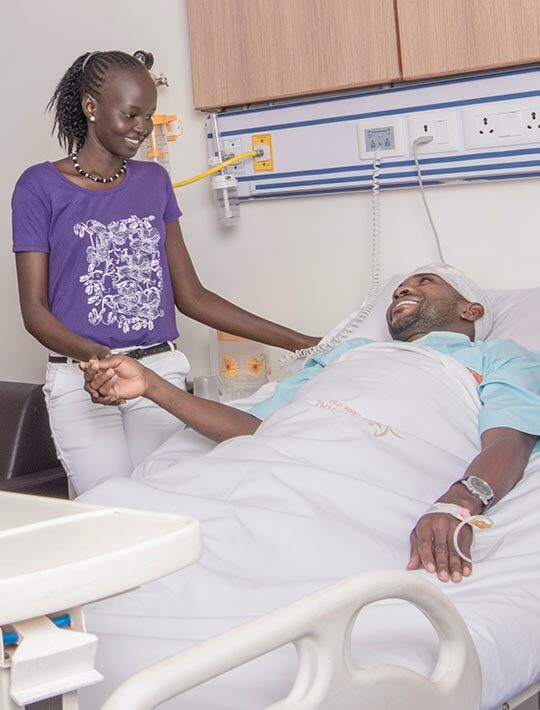 "The staff of doctors and nurses guided me properly through my entire visit. The hospital building is impressive just like a good hospital of international standards." "My surgeon and primary care doctor worked together for my recovery. I'm now feeling teriffic." Ans - You shall be welcomed by our Executive at the airport who will be your assistant throughout your stay. They will help you in boarding the cab arranged by the hospital and will arrange your stay at the hotel that fits your budget. What if the patient needs immediate care? Ans - In case the patient needs immediate care, we send a team of doctors for intensive care services in our well-equipped ambulance. Where do I go when I reach the hospital? Ans - You will meet your Hospital Companion on your first day who will walk you through the procedures. They will fix your appointment, take you to the doctors, give you a tour of the hospital and resolve all your queries. How do I and my family members communicate with the hospital staff, given that they speak a different language? Ans - Most of our doctors are multilingual which means language will not be a barrier. Also, we shall arrange coordinators and interpreters who act as a medium of conversation between you and your doctor. We shall also assist your family and friends for the same. Is there a dedicated lounge for International Patients? Ans - Yes, at the dedicated lounge for International patients, you will be attended well by the assistants, helpers, and the medical staff. What is Day Care Surgery? Ans - Day care surgery means patients undergoing surgery / procedures do NOT require to stay overnight in the Hospital. Ans - Patients can deposit the payment by cash/Demand draft / Credit cards like MASTERCARD / VISA cards . Where will my out of station attendant / Visitors stay at night ? How long I will be at the Hospital? Ans - The length of your stay is based on your progress and your treatment. Please check with your doctor. Why Can't I use my own medications when i am in the Hospital? Ans - Our Pharmacy is committed to making sure patients use prescribed drugs safely. When you bring medicines from home, we don't know if the drug has been properly stored or original or is otherwise safe. To make sure our patients receive medication in the exact dosage needed, they are given only those medications ordered by their doctor from the hospital Pharmacy. What is the time of discharge? Ans - On the day of your discharge, our goal is to have you ready to leave before 12 noon. Your doctor will write your discharge order after the morning visit and we assure a quick completion of formalities. Is Dining facility available at Sharda? Ans - Yes, we do have canteen facility at University and Hospital as well. Lego House in University premises ; Urban Thali , Uncle Cafe , More than Cafe and Sharda Food within the Hospital Premises.